Even if we love and care about another person, relationships don’t always work out and can end for a variety of reasons. In the midst of a crumbling relationship, it can be hard to recognize problems for what they are. Ending a marriage becomes even trickier, and the question of when, and even if to hire a divorce lawyer is one you may need to ask yourself. As problems in your marriage mount, you may be compelled to consider whether or not divorce is the best choice. The question of dissolving a marriage is ultimately an intense, difficult, and incredibly personal choice that may throw your entire world into upheaval. During a time that may be full of emotional turmoil, where you may not always think clearly, having a skilled professional to guide you through the process can be a huge benefit. This may not be a comprehensive list, but here are a few questions to ask yourself if you’re considering hiring a divorce lawyer. By the time you get to this stage, you’ve probably asked yourself things like why you’re staying married or if you can possibly salvage your relationship. 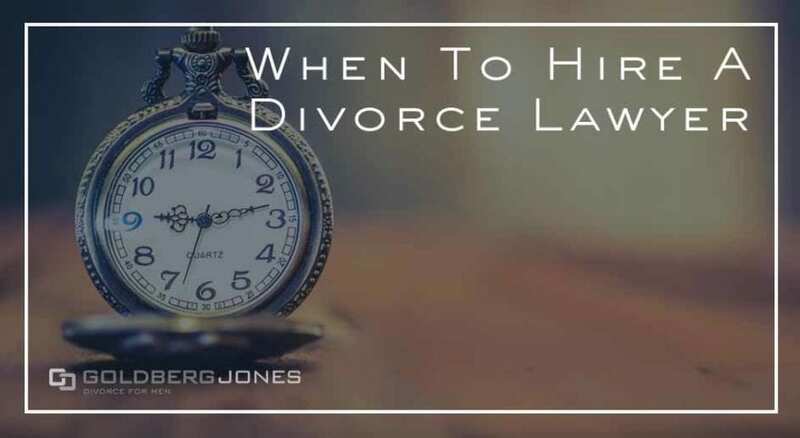 These are important topics to be sure but are relatively unrelated to whether or not you should hire a divorce lawyer. At this point, the decision to dissolve your marriage has likely been made, and the next step may be to figure out if you need representation in the coming split. With the proliferation of do-it-yourself divorce websites, online tools, and similar resources, you don’t necessarily need an attorney to end your marriage. In many ways, the process can be relatively simple and straightforward. It can also become incredibly complex. If there are children and custody disputes involved, that can lead to issues. If you and your spouse have a great deal of shared property to divide, like homes, cars, or debts, that can be a point of contention. and much more can factor into your divorce settlement. The more there is to debate and argue over, and the more you and your spouse disagree about how to proceed, the more tangled things can become. The more complicated the situation, the more likely you are to benefit from hiring a divorce lawyer to protect your rights and interests. Not only can an experienced attorney help shepherd you through the process, one may also provide peace of mind in a stressful time. It is possible to handle the details of a split yourself. This is probably the most fitting in cases of shorter marriages, ones where there are no children in the picture and little in the way of shared property to distribute. As already indicated, the more intertwined the lives of you and your spouse, and the more contentious things become, the likelier you are to need a divorce lawyer. Especially if your spouse has enlisted an attorney, it may be the right time to find representation of your own. If for no other reason than this will put you on even footing. Beyond that, there are a number of additional areas where the presence of a divorce lawyer may prove useful. The more property you and your spouse own together, the more assets you have to divide, and the more complicated this process will be. Washington is a community property state. Under these statutes, all assets acquired during a marriage, even those held in one individual’s name, are viewed as belonging to both parties. In the case of divorce, this means that it can all be divided between you and your spouse in an equitable fashion. This doesn’t mean all the property will be split evenly, but assets will be distributed so each party comes out on relatively even terms. It is possible for you and your soon-to-be ex to work together to come to terms, but if this becomes contentious, you may want to enlist a lawyer or mediator to help come to an agreement that is fair and balanced for everyone. One factor that frequently causes problems in a divorce is child custody. You and your spouse will need to resolve these issues. Again, it’s possible to come to an arrangement without outside help, but when kids come into play, things often get heated and messy. Enlisting the services of a divorce lawyer experienced in these cases can be a huge benefit. Not only may one help calm down tense situations, but a professional can fight to ensure your rights as a parent. If you hope to protect your guardianship, custody claim, visitation, and more, you may be best served by hiring an attorney. Child Support: If there are kids involved in your divorce, child support may well come into play. These payments are designed to provide for the continuing care of minor children and to cover costs of food, clothing, shelter, education, and other necessities. In general, the party with the most overnights will receive payments from the other, though they can still be present in cases of 50/50 shared custody. Spousal Support: Though not awarded in every case, spousal support may be ordered to help your former partner meet financial needs in the wake of divorce. The amount of these payments is based on what is fair and equitable in a given situation, and may consider the age and health of both spouses, the length of the marriage, and future earning potential, among other factors. Spousal support may be awarded for a limited time or it can continue indefinitely. While the DIY methods may result in a quicker, cheaper divorce, they can also lead to issues down the road. Custody arrangements, parenting plans, and settlements can be complex. If you’re handling them yourself, unless you have a legal background, it’s all too easy to sign something you don’t fully understand. These things can be difficult, not to mention expensive, to modify after the fact, and will likely require an attorney anyway. Hiring a divorce lawyer up front can head off potential calamity in the future and ensure that you don’t get blindsided by issues you weren’t aware of. Ending a marriage can be a complicated process. As in most legal cases, you will likely be best served by hiring a divorce lawyer, even if your situation appears relatively straightforward. Things can get tangled in short order and an experienced attorney can help you understand what you’re agreeing to, explain your rights, and show you how to achieve an optimal result.